Let there be light! In your smart home, that is. There are a few ways to get smart lighting in your home—through smart light fixtures, smart outlets, smart switches and smart bulbs. Each has its advantages. For smart light fixtures, you’ll obviously have to switch out your existing hardware, whether it’s a ceiling light or wall sconce. But, you’ll have the flexibility of using any type of light bulb, and any smart home system you’re using will always be able to turn them on and off. With bulbs, outlets and switches, you run the risk of someone physically turning the light switch or fixture off, which makes it invisible to your other smart home devices. Smart outlets and switches have the advantage of you not having to replace any of your current fixtures or bulbs. And they are usually able to be controlled on their own without a hub. Examples include the WeMo Switch outlet ($39.99 on Amazon) and WeMo Light Switch ($48.33 on Amazon). Smart light bulbs, like smart switches and outlets, can be used in existing fixtures and lamps. 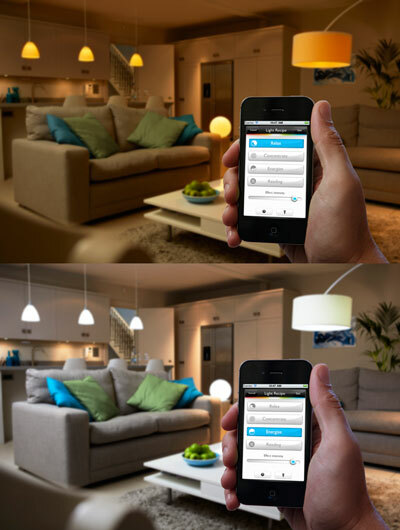 The big benefit to going with a smart bulb is that you can change the color of light that the bulbs produce. If you like a warm white light, you've got it. If you want to adjust the amount of blue light so you have warm tones at night to help you sleep and cool tones in the morning to wake you up, you’re covered. Some bulbs even let you go beyond white, letting you create the mood with any color of light, like the Philips Hue White and Color Ambiance Kit. The Hue White and Color Ambiance Kit is the second generation of Philips remarkable color-changing smart bulbs, and the new Hue bridge now boasts compatibility to a host of platforms and products—including Amazon Alexa compatible devices, like Echo and Tap, and Apple HomeKit. So not only can you use a smartphone or tablet to control your lights, now there is voice-activation as well. The kit, which is a somewhat pricey ($199 on Amazon), comes with three, updated bulbs which shine 800 lumens rather than the 600 lumens in the original Hue package, and a small, shiny white bridge. Set-up is a snap, we just screwed the Philips bulbs into our chosen light fixtures—which included a standing lamp, a table lamp and the ceiling fixture in our shared apartment hallway—plugged the Hue bridge into our Wi-Fi router and downloaded the app (free for iOS and Android). The light bulbs themselves are nothing special. They have a flat top, unlike your everyday, globe-like bulbs, and they look fine in fixtures—though we wouldn’t be prone to using one as a decorative bulb without a shade. Out of the box, we weren’t thrilled with the bulbs’ white light. However, the type of white, or color temperature, that the Philips Hue bulbs produce can be modified with the Philips Hue app to match your tastes exactly. The easiest place to start is Scenes, which offers an array of different, pre-set shades with names like Deep Sea, Beach and Ski. Want to try to your hand at creating your own color? Tap on Light Recipe to mix and match between moods like Relax, Concentrate, Energize and Reading. the cool tones in the scene below energize you in the morning. While exploring the color temperature and scenes with the app, we found that some hues were better than others. Using the scenes in Hue’s arsenal, we found the reds, yellows and whites to be more accurate than the greens, which scream fluorescent, and the blues, which tend to be dim, cold and indigo, sometimes looking almost like a black light. When untouched by yellow or red, scenes like Ski reminded us of a hospital waiting room, certainly not the slopes. Our favorite scenes tended towards soft yellow and orange tints, like Laila or Sunset, which we adjusted depending on the time of day. 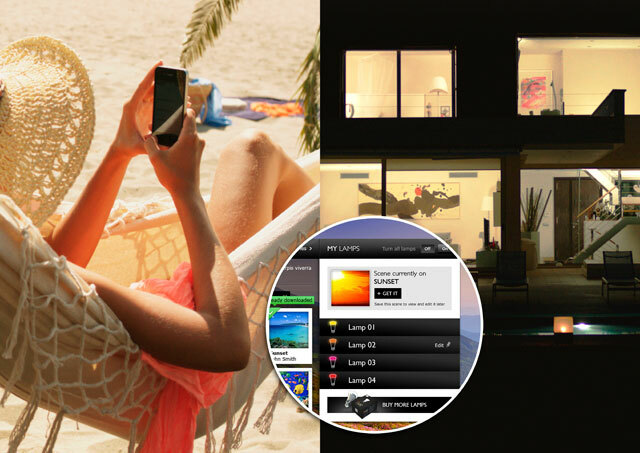 There’s also a wealth of third-party apps under the More Apps for Hue setting such as OnSwitch, which allows you to try even more scenes based on categories like Nature, Skies or Candle Light, or IF, which when connected to Hue, allows you to create light recipes based on actions. Like, If it begins to rain then change the light colors to blue, or Flash your lights when you’re tagged in a new Facebook post. You can also automate operation of your bulbs by assigning timers and even geofencing them so they’ll track your location and automatically turn lights on and off when you come in and out of your home. Recurring schedules are also available, allowing you to program a gradual brightening to wake up or dim as you go to sleep. For us, it was a great help to simply put our hallway light on a timer to come on at sunset and go off in the morning. If, however, you want to be old school, you can also turn off your smart lights with the Hue Tap Switch ($59.97) and the Hue Wireless Dimming Switch ($24.99). Both connect to the bridge, and can be used as stand-alone lighting controls or mounted as a wall switch. What you can’t do is turn on and off that lights with a regular wall switch or switch on the fixture. When you turn off the light manually, the socket isn’t getting power. 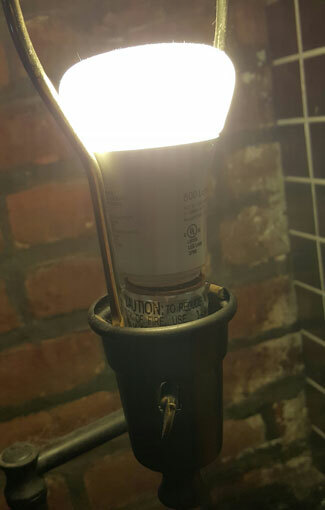 No power means the bulb won’t be connected to your hub and won’t respond to your commands. It will take some time to get used to using your phone, voice or new switches, and you’ll need to notify guests. Fortunately fixing the problem is easy if someone forgets and uses the wrong control. Reconnecting is a simple matter of flipping the switch back on. Now about that smart home connection. We used our Amazon Echo, which has Amazon Alexa Voice Service. Alexa is also available through the new Amazon Tap ($129.99), Amazon Fire TV ($84.99) and Fire TV Stick with Voice Remote ($49.99). For Echo, we simply went to the Amazon Alexa app on our phone, selected Smart Home and connected the Philips Hue service through the third party page, where it was immediately discovered our system. And then the fun began. Through Alexa’s voice control, turning lights on and off became not only a simple, hands-free directive, but a parlor trick for the kids. We could also ask Alexa to make the lights brighter or dimmer as well. The Alexa app will pull in all of your light bulb names and group names, so the naming only happens within the Hue App. If you have a Fire TV or Fire TV stick and use the iOS or Android app as a controller, you also use the app to issue voice commands to Alexa. If you have an iPad or iPhone, Siri provides similar voice control and functionality. Instead of using an Amazon Alexa powered device, you’ll connect your Hue bulbs’ hub with the Hue app. Apple’s HomeKit, which is part of iOS 8.1 or higher, provides the bridge so you can use Siri to operate the Philips Hue bulbs. And since Siri is built into iOS, there’s no configuring. Your bulbs will work with any of the lighting appropriate commands available through HomeKit. There’s no denying the “gee whiz” factor of the newest iteration of Hue, and we’ve enjoyed the geofencing, timer function, and ease of voice control through Alexa. But, since we don’t live in a dorm room or a brothel, we’re not thrilled with the blue, purple and green colors Hue is capable of. However, sticking with the warmer shades of white, orange and yellow, we’ve found great recipes that work for all our moods. A connected home is a big part of the future, but the price needs to come down to make this particular part of it more accessible. 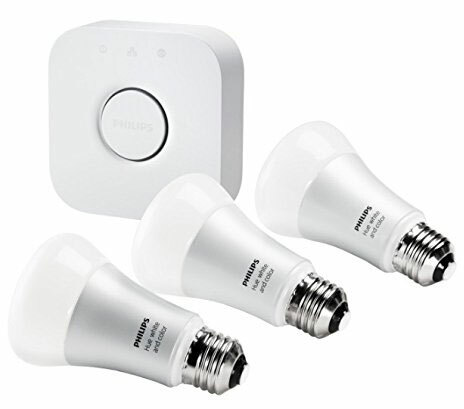 Fortunately, there is a less expensive (though less flexible) option: the Philips Hue White starter kit ($79.99). The Hue white bulbs emit a single color, a warm 2700K light at a maximum of 800 lumens. But if you’re willing forgo the color changes, it’s a great option. Bulbs to expand your system are available: a Hue White bulb 2-pack, costs ($29.99) and a single Hue White and Color bulb costs ($59.99). Both bulbs can be used with the Hue bridge that comes as part of both starter packs.